We got the slow boat from Koh Samui over to Koh Tao the smallest of the 3 islands. The water around this area is beautiful a real Sapphire blue, when you get to the island the water then clears and you can see all of the fish swimming around. Koh Tao is one of the top diving spots in the world, but we will only be snorkelling. We got to Hat Sairee the main beach area and tried to book into some bungalows that we had been recommended but they were full. Wayne then spent a good hour trying to find somewhere, we finally managed to get a room. The next day though we checked out as we had found a nice bungalow to stay in. Hat Sairee beach is a nice beach with lots of bars which put bean bags outin the evening and make fire pits in the sand which lights up the beach at night. We did not do very much in Koh Tao either mainly sat out the front of the bungalow and read our books. We did manage to find some good bars. In Choppers bar we were able to watch the football and the rugby and we even had a roast dinner there on the Sunday (2 in two weeks)! On our last day we booked a snorkelling trip, but the weather had turned quite overcast, so not a perfect day to go but still good. We were meant to visit 5 sites and snorkel at each one, but because of the weather we were unable to stop at Shark Island (where there are actual reef sharks) and Mango Bay. This was a bit disappointing as Mango bay is suppose to be one of the best spots, but the sea was quite choppy so a good idea. Each of the 3 sites were excellent and we saw loads of tropical fish including, clown fish, parrot fish and angel fish there were also loads of sea cucumbers and the coral was really lovely. We even managed to see a black tip reef shark about 1m - so not scary at all. Our last stop of the day was Nangyuan Island, which is just off of the North Western tip of the island and is linked by 3 white beaches and it is a really beautiful place. The weather though had turned quite cool so we could not enjoy the beaches which was a shame. We had a good day but because of the wind it was quite cold getting in and out of the water. 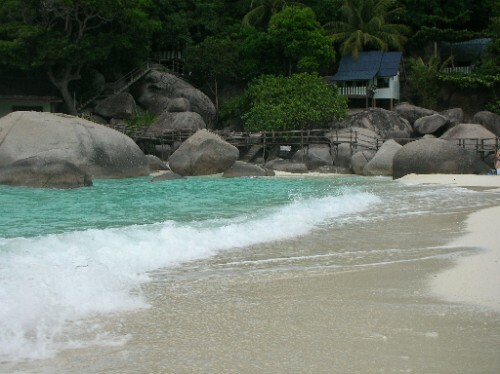 Koh Tao is a lovely island with a really relaxed atmosphere, good food and good bars!